Yesterday morning on my bird walk into work I heard the familiar Spring singing and calling of Red-Winged Blackbirds. "This is the wrong time of year to be hearing this!" I said to myself. I didn't see any of their familiar black silhouettes on the cattails or bulrushes. Whipping my head all around I couldn't tell right away were their sounds were coming from. 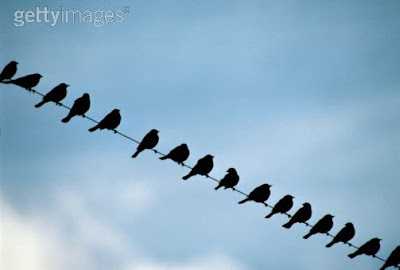 Finally, I spotted them high up on the power lines singing their hearts out in the morning sun. They all appeared to be males with good looking feathers in bold colors. Now I know Red-wings flock together in winter and will even spend the winter in nearby areas. I'm just wondering about the behavior I saw. Do males flock together exclusively? Was I seeing a group of young males just coming into their manly plumage and migrating/flocking a little late? Any experts on Red-wings out there that can enlighten me? I don't know the answer about the redwings, but last Saturday, there was a flock of 100's at Camas NWR.